At Musikmesse Frankfurt 2002 Italian company Ketron launched several digital pianos and performing keyboards. Six instruments including Digital Grand DG100, sound module XD3 and the Avanced Life Perfomers XD9 and Vega were unveiled. 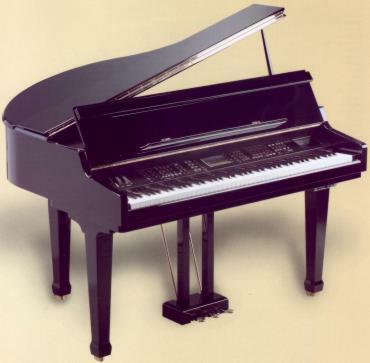 Digital pianos DG20 and DG30 are equipped with an 88-key hammer action keyboard, so is digital grand piano DG100. DG100 features full technology of the SD1 performing keyboard, which was successfully launched at winter NAMM 2001. SG100 is available in glossy white or black finish. The DG100 sports a powerful 2x60 watts on-board stereo system with two midrange speakers, two tweeters and a subwoofer. Like the SD1 the SD100 features a large display, sound generation with 310 preset sounds including a stereo grand, 16 MB RAM sounds, two mic-inputs with mixer, harmonizer, vocoder, vocalist, 6 GByte harddisk, and, last but not least, the distinctive live sounding arranger. DG30 and DG20 have less sounds, limited to piano, strings, choir and organ including variations. DG30 features a sequencer and three pedals, DG20 only has no sequencer and two pedals. 61-key with velocity models XD9 and Vega look similar, on top of the standard international sound generation Vega boasts extended oriental features including scale converting. Both instruments' sound generation is 32-multitimbral and 64-note polyphonic. The arranger features 170 international styles plus 50 oriental styles of the Vega. In addition to 290 preset sounds and 292 GM voices of the XD9 the Vega comes with 27 extra oriental sounds and 450 percussions. Sounds can be upgraded with an optional flash memory board, other options are harddisk and vocalist. Further details are an internationally compatible video interface, SMF-player, floppy drive, MAC/PC-interface, and a built-in sound system with a power of 2x22 Watts. 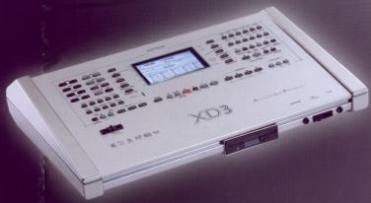 Ketron XD3 is the sound module version of the XD9 without keyboard and amplification.